The hydrotherapy at the Flamingo pool has become the focus for many individuals within th Axe Valley and beyond. Heated to 34°/91°F and with ultra-violet light disinfection making a virtually chlorine free swim. 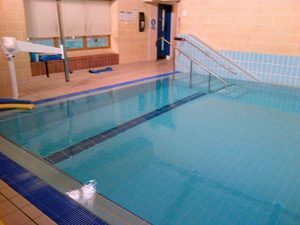 The Hydrotherapy Pool incorporates underwater pressure jets creating a ‘jacuzzi’ effect which provides therapeutic effects as well as giving necessary resistance to exercise. The warm water helps to relieve pain, induces muscle relaxation, increases buoyancy giving greater range of movement and can create resistance to build muscle strength. It has great benefits for orthopaedic and neurological conditions, osteoarthritis, rheumatoid arthritis, neck and back disorders, sports injuries and physically or mentally disabled patients. At the Aqua-Gym, staff will provide a consultation and structure a programme to suit you and your specific needs, goals and medical conditions. They will help you through each session and re-assess your progress regularly. 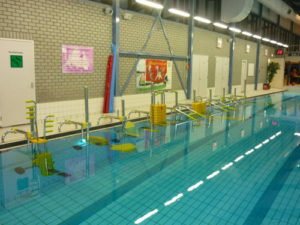 Two types of sessions are on offer, Group Mobility and Aquagym. The water allows more movement due to the support, more buoyancy for the overweight, lower impact on joints and muscles, more resistance and less muscle soreness following a workout.